Many visitors come on holiday in Phuket simply for the beaches, but there are many things to see and do in Phuket out of the water. 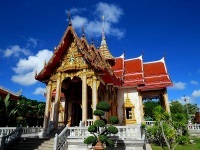 Phuket's long and fascinating history is detailed at the Thalang National Museum, while the island has almost 40 Buddhist temples, including the famous Wat Chalong. 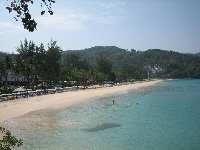 The 147-foot (45m) Big Buddha is also a popular attraction, visible from most of southern Phuket. Phuket has rightly earned its reputation as a paradise for outdoor activities, and visitors will enjoy exploring some of the biggest waterfalls in Thailand, and other pastimes like fishing and hiking. Also interesting are the Muay Thai boxing matches staged in Saphan Hin Stadium. Fun in the sun and sea is the main attraction of Phuket however, and there is no end of opportunities for snorkelling, scuba diving, cliff diving, sailing kayaking, and jet-skiing.